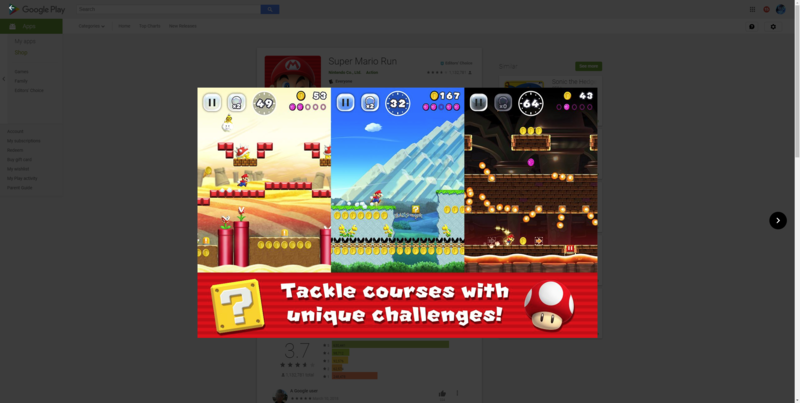 Earlier this month, Google began testing a new design for the Play Store's website. While the larger screenshots and dedicated review pages were much-needed changes, there were a few annoying regressions. Google switched image formats (from WebP to PNG/JPEG), causing screenshots to load slower, and navigating through the site was more difficult. Google seemingly halted the rollout just a few days ago, perhaps due to the complaints brought up. But now the new design appears to be live for everyone, with almost nothing changed from the initial rollout. The only difference I can tell is that Google went back to using WebP for images. When you click on a screenshot, you still cannot exit by clicking outside of the image - you have to click the tiny back arrow in the top left corner. Keyboard navigation isn't possible either. Hopefully these shortcomings will be addressed soon. In the meantime, we're nearly done updating our Toolbox browser extension to work with the new design.